Pembroke Welsh Corgis are immediately identifiable by their short stature, prick ears, and foxy face. The tail may be closely docked (not in all countries), but some puppies are born natural bobtails. Besides the tail difference the Pembroke is not as long or heavy-boned as the Cardigan Welsh Corgi. Corgis are considered chondrodysplastic dogs, that is, having the characteristic of slightly bowed limbs and the tendency for back problems. Slightly longer than tall, they have a straight back and are not extreme in any area. Adult Pembroke Welsh corgis are about 10 to 12 inches tall and weigh from 23 to 29 pounds (10 to 14 kilograms). They are full size at about a year of age, but some keep filling out until age 2 or even 3. Corgis have weatherproof coats—double but short. The color ranges from a rich red or fawn to black or sable with white markings. The blacks usually have white and tan to make them tri-colored with heads varying from red to black. Occasionally a fluffy corgi will appear in a litter. These puppies have a longer, softer, fluffier coat than is typical. While these puppies make wonderful pets, that coat is undesirable for the show ring. Pembroke Welsh Corgis are known for their quick intelligence and forceful will. They are active, animated dogs and do not ever want to be left out of the action. In their own minds, they are big dogs in small bodies. These dogs still handle livestock much larger than they are, and to do so use speed, a quick nip, and sheer determination. As all-around farm dogs, corgis undoubtedly hunted vermin and guarded the homestead as well as herding livestock. Corgis need exercise and training with a firm but kind hand to make the most of their talents. Corgis can be prone to excessive alarm barking and to digging or chewing if left alone too much or not exercised enough. They want to be part of the family and do not do well left in kennels. Most corgis are fine with other pets and children if they have been raised with them. Beware that they will sometimes chase and nip at the heels of small running children because of their herding instincts. Pembroke Welsh Corgis are hardy little dogs. They require only a quick, weekly grooming except in times of shedding. They need to be watched carefully for developing obesity. These dogs are easy to keep and do well with a minimal amount of food. Added weight can be an extra strain on the low back. Exercise is a must, both for mental health and to keep the weight under control. 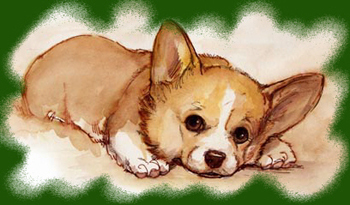 Corgis are people oriented and thus love to work with them and enjoy training. Despite their appearance, these are athletic little dogs who excel in herding and agility competitions. They are quick to learn tricks and seem to have a sense of humor. They are excellent watchdogs, if anything prone to unnecessary alarm barking. Perhaps because of their small stature, corgis seem to be attracted to high places and may occasionally be found on the back of the sofa or in the middle of the kitchen table! Corgis do need a firm but kind hand in training. If left to their own devices, they can be manipulative and will take charge themselves.